Transversus abdominal plane (TAP) block is one of the several modalities used for pain relief in the postoperative period. It involves deposition of local anesthetic into the fascial plane superficial to the transversus abdominis muscle, where nerves supplying the anterolateral abdominal wall traverse (T7–T12 intercostal nerves, ilioinguinal and iliohypogastric nerves, and the lateral cutaneous branches of the dorsal rami of L1–L3). TAP block provides excellent postoperative analgesia, decreases opioid requirement, and is conducive to favorable respiratory mechanics. These facilitate early mobilization and discharge, significantly improving the patient's quality of life up to 6 months postoperatively. However, rare complications of TAP block such as injury to the kidney, spleen, liver, and intestines have been reported if the fascial plane is localized by the blind insertion technique. Use of ultrasonography for regional blocks offers direct visualization of the anatomical plane, needle placement, and the pattern of local anesthetic spread resulting in increased safety margin and optimal block quality. The successful use of US-guided TAP block has been reported in several other surgical procedures: donor hepatectomy, colorectal surgery, inguinal hernia repair, laparoscopic bariatric surgery, retropubic prostatectomy, iliac crest bone graft, and also in patients experiencing somatosensory chronic abdominal pain where other forms of pain management had failed.,,,,,,, In the present study, we compared the analgesic efficacy of ultrasound (US)-guided bilateral TAP block using ropivacaine with conventional systemic analgesia in patients undergoing laparoscopic IPOM surgery. We also studied the effects of TAP block on the time of appearance of bowel sounds, time of ambulation, length of hospital stay, and side effects, if any. All patients underwent a thorough preanesthetic evaluation. Tablet ranitidine hydrochloride 150 mg and tablet alprazolam 0.25 mg were given to all patients on the night before and the following morning of surgery. Patients were kept fasting for 6–8 h before surgery. In the operation theater, monitors including electrocardiography, noninvasive arterial blood pressure (NIBP), pulse oximetry, capnography, and neuromuscular monitor were used. After obtaining the baseline values, intravenous (i.v.) access was secured and midazolam 1 mg i.v. was given to all the patients. Anesthesia was induced with propofol 1.5–2 mg/kg and fentanyl citrate 1 μg/kg, followed by vecuronium bromide 0.1 mg/kg to facilitate placement of an appropriate-sized ProSeal laryngeal mask airway (LMA® ProSeal™ Airway). A gastric tube was passed through the drain tube in all cases. Patients were mechanically ventilated with a tidal volume of 6 ml/kg and respiratory rate was adjusted to maintain EtCO2 between 36 and 44 mmHg. Anesthesia was maintained with sevoflurane (a minimum alveolar concentration of 0.8–1.2) in 50% oxygen with nitrous oxide using a closed-circuit breathing system (Prima SP, Penlon, Abingdon, Made in UK, CE0473). Supplemental boluses of i. v. fentanyl citrate 20 μg were given to keep the heart rate and blood pressure within 20% of baseline values. Additional maintenance doses of i.v. vecuronium bromide (0.02 mg/kg) were given to achieve adequate muscle relaxation. All patients received crystalloids at a rate of 10 ml/kg/h intraoperatively. Group I patients underwent surgery without any further intervention while Group II patients in addition to conventional systemic analgesia protocol received bilateral US-guided TAP block before surgical incision. A 38-mm linear array US probe (3-6 MHz) was positioned in the midaxillary line in the axial plane halfway between the iliac crest and the costal margin. Views were considered satisfactory, if subcutaneous fat, external oblique muscle, internal oblique muscle, transversus abdominis muscle, peritoneum, and intraperitoneal structures were identified. A 200-mm long, 20-G short-bevel needle (Stimuplex, B. Braun Melsungen AG, Germany) was introduced anteriorly and inserted in plane under real-time US guidance to lie between the internal oblique and the transversus abdominis muscles. The placement of the needle in the right plane was confirmed by hydrodissection using 2 ml of saline and negative aspiration of blood, followed by injection of 0.5% ropivacaine (Ropin, Neon Laboratories Ltd, Mumbai, India), 15–20 mL each on either side. An echolucent boat-shaped space was formed between the two muscles on injecting the local anesthetic. Participants received a total dose of 3 mg/kg of ropivacaine. This dose has been used in a previous study, demonstrating the efficacy of the TAP block. The surgical procedure followed thereafter. All patients were operated using two 5 mm and one 10 mm port in the midclavicular line. The dual surface mesh was fixed using transfascial sutures and tacks (ProTack™, Medtronic USA). In all cases, 30 min before reversal of neuromuscular blockade, intravenous 75 mg diclofenac sodium and 4 mg ondansetron were administered. The surgeon was asked to infiltrate the port sites with ropivacaine 0.5% 10 mL, while closing the abdomen, in both groups. At the end of the surgery, neuromuscular blockade was reversed with neostigmine 0.05 mg/kg and glycopyrrolate 0.01 mg/kg. The trachea was extubated when the patient was awake. The patients in both groups were evaluated for intraoperative fentanyl requirement. Postoperatively, patients were transferred to the postanesthesia care unit for observation for at least 2 h and then later to the ward. The intensity of postoperative pain was evaluated using the VAS during the first 24 h. In the postoperative anesthesia care unit, pain assessment was performed every 30 min for the first h and was followed up in the ward for a period of 24 h at intervals of 4, 6, 12, and 24 h. Patients in both groups received intravenous diclofenac sodium 75 mg at 8 h intervals. If the VAS score exceeded 4 in any patient in either group, then the patient received intravenous tramadol 25 mg, as rescue analgesic. Postoperatively, patients were also assessed for time of ambulation, return of bowel sounds at 6, 12, and 24 h, and time of discharge from the hospital. The presence of nausea, vomiting, and sedation were recorded. Complications related to TAP block were also noted. The data were collected by trained nurses (in the postanaesthesia care unit and the ward) who were blinded to the anesthesia technique and the randomization of the patients. The progress of the trial has been depicted in the Consolidated Standards of Reporting Trial (CONSORT) diagram [Figure 1]. Based on a pilot study of 10 patients, we expected that the mean and standard deviation (SD) of VAS in Group I to be 6.0 and 2.5 while in Group II, it was expected to be 4.0 and 1.5. Twenty-two patients were required in each group to obtain a power of 0.9 with alpha set at 0.05. However, we enrolled 25 patients in each group to take care of any dropouts from either group. The statistical analysis was carried out using Statistical Package for Social Sciences version 17.0. Normally distributed data were presented as mean (SD) and categorical data as frequencies. Unpaired t tests were used for comparison of continuous variables between the two groups. For nonnormally distributed data, Wilcoxon rank-sum test was used. Differences between groups were assessed with Chi-square or Fisher's exact test for categorical variables as appropriate. P < 0.05 was considered as statistically significant. There were no differences between the two groups with regard to age, height, weight, BMI, and duration of surgery as shown in [Table 1]. The intraoperative hemodynamic and intraoperative requirement of fentanyl were comparable in two groups. The VAS scores as shown in [Table 2] were higher at all measured points of time and statistically significant, except at 90 min (P = 0.079), in Group I as compared to Group II, and the difference was highly significant (P < 0.001), except at 30 min (0.017). 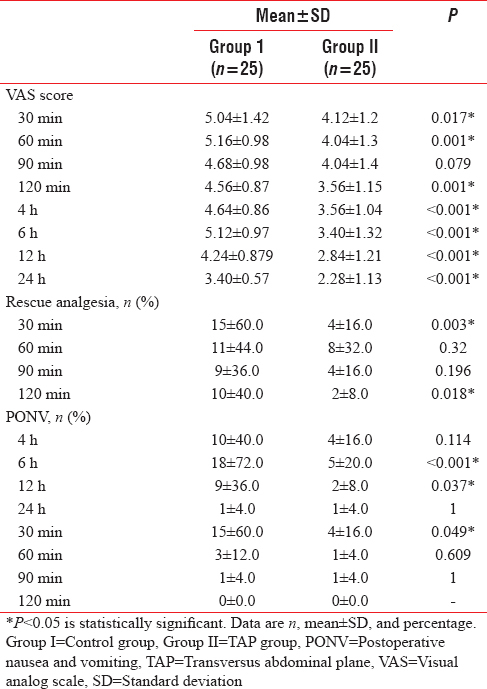 The demand for rescue analgesia was higher in Group I [Table 2] at all times in the postanaesthesia care unit but was statistically significant at 30 min (P = 0.003) and at 120 min (P = 0.018). In the ward, the demand for rescue analgesia was significantly higher at 6 and 12 h.
The incidence of nausea and vomiting was significantly higher in Group I, but only at 30 min (P = 0.049) after which it was comparable in the two groups [Table 2]. No patient complained of sedation or pruritis in either group. At 12 h, 7 patients (28%) of Group II had started to ambulate against none in Group I. At 24 h, 16 patients (64%) of Group II ambulated against 7 patients (28%) of Group I. There was statistically significant difference in time to ambulate at 12 h (P = 0.010) and at 24 h (P = 0.011) as shown in [Table 3]. It was observed that although bowel sounds appeared at 12 h in both groups, the difference was statistically significant (P = 0.007) as more patients of Group II had the presence of bowel sounds at this juncture. There was no statistically significant difference between two groups at 24 h [Table 3]. Statistically significant difference (P = 0.026) was observed between the two groups for time of discharge after surgery with the mean time of discharge of patients being 23.6 h and 22.6 h for Groups I and II, respectively [Table 1]. Laparoscopic IPOM repair of ventral hernia is a commonly performed surgical procedure. Our study demonstrated that supplementing a conventional multimodal analgesic regimen with US-guided TAP block resulted in decreased VAS scores and decreased requirement of rescue analgesics. There was early ambulation, early appearance of bowel sounds, and shorter discharge time from hospital. There was also decreased incidence of nausea and vomiting. The modalities for providing postoperative pain are developing as the components of standard multimodal analgesic regimen continue to evolve. Local anesthetics have opioid-sparing effects and improve patient satisfaction. US-guided block further improves the efficacy and accuracy of the block by giving real-time images, reducing chances of failure. We performed the TAP block under US guidance using ropivacaine (3 mg/kg) without any untoward effects although Griffth has cautioned that this dose may be accompanied by local anesthetic toxicity. It has been suggested by Kato et al. that local anesthetic absorption following TAP block may partly result from leakage of the drug from the fascial plane out into the surrounding abdominal musculature. It is likely that ultrasound guidance may actually increase the accuracy of injection and decrease plasma levels of local anesthetic compared with a blind technique. The block was performed preoperatively though there is controversy as to whether the block should be administered preoperatively or postoperatively., The timing of placing the block is important; if the duration of surgery exceeds the peak plasma concentrations of ropivacaine, it is unlikely that clinical neurotoxicity of the drug would be detected. The study done by Griffiths, however, has implications for TAP blocks performed at the conclusion of surgery for pain relief, or for brief operations, where potentially neurotoxic plasma concentrations could be present in conscious patients. There have been numerous studies involving the use of TAP block by blind, laparoscopic, and US-guided techniques for abdominal and inguinal surgical procedures with reports of providing good postoperative pain relief.,, A meta-analysis comprising of 31 studies including 1,611 adults evaluated the analgesic efficacy of US-guided TAP blocks in abdominal surgery (laparotomy, laparoscopy, and cesarean delivery). It was found to provide marginal postoperative analgesic efficacy; however, there was no additional analgesic effect in patients who also received spinal anesthesia containing a long-acting opioid. It was also reported that the minimal analgesic efficacy was independent of the timing of injection, the approach adopted, or the presence of postoperative multimodal analgesia. These findings need to be interpreted with caution due to heterogeneity of the results. In our study, the VAS scores in Group II were significantly lower as compared with Group I which persisted up to 24 h, as reported in previous studies., In a prospective randomized controlled trial where laparoscopic-assisted TAP block was given with 0.25% bupivacaine compared to saline for postoperative pain control in patients undergoing laparoscopic ventral hernia repair, it was reported that TAP group with bupivacaine significantly lowered pain scores and decreased opioid consumption for 24 h. The fascial plane of TAP targeted by the action of local anesthetic has poor vascularity, and hence, the action is prolonged and not associated with any major complication. In the present study, we found that the group receiving TAP block required significantly less rescue analgesia than the control group (P = 0.03). There was reduced overall tramadol consumption in the first 24 h postoperatively proving that a single-shot TAP block can produce effective analgesia for at least more than 24 h. The overall consumption of tramadol in Group I was 2.76 (2075 mg compared to 750 mg) times higher than Group II. Time to ambulation after surgery was significantly shorter (P = 0.011) in Group II patients. Our results are supported by previous work. There was a significant difference in the appearance of bowel movements in the two groups. 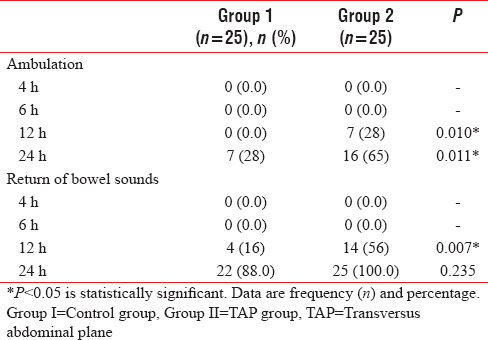 Bowel sounds returned at 12 h in both groups, but in greater number of patients in Group II as compared to Group I (P = 0.007). In the present study, all our patients were discharged within 24 h. Group II patients were discharged earlier than Group I patients (P = 0.026). Studies have reported that majority of the patients are discharged after 24 h following hernia surgery., In a study of 202 patients who underwent ventral hernia repair by laparoscopic IPOM, the mean hospital stay was 1.8 days. A recent study supports this finding of the shorter length of hospital stay. The incidence of postoperative nausea and vomiting was higher in the Group I in our study. Similar results have been reported in an earlier study. TAP block, by reducing pain, has probably decreased the incidence of postoperative nausea and vomiting. We used the ultrasonography-guided technique to avoid complications as more complications have been reported with the blind approach. There were no adverse events due to TAP block in this study. Although most studies have not reported complications attributable to TAP block, there have been a few studies which reported local anesthetic toxicity, inadvertent local anesthetic spread involving femoral nerves, and organ injuries such as liver lacerations and colon puncture following TAP block., Jankovic et al. observed a TAP catheter in the peritoneal cavity during an open nephrectomy; however, no reports of injury to the organs was reported. There are a number of limitations of our study. Although a single injection can achieve sensory block over a wide area of the abdominal wall, we were unable to assess the extent of block as it was performed after induction of general anesthesia. Our study period was limited to the first 24 h postoperatively. Finally, we did not evaluate patient satisfaction in our study although there have been many studies reporting high patient satisfaction with TAP block. US-guided TAP block decreased the incidence of pain and reduced requirement of rescue analgesia and antiemetics in the postoperative period in the study. It also helped in decreasing the time to ambulation and facilitated early discharge from the hospital. These advantages need to be confirmed by larger studies to establish TAP block as a reliable modality for providing pain relief in patients undergoing laparoscopic IPOM surgery. We thank the nursing staff of the PACU and ward for their assistance and to Ms. Parul Chugh for statistical analysis of data. We also thank Mr. Prakash Bisht for the secretarial help in writing this manuscript. Rudmik LR, Schieman C, Dixon E, Debru E. Laparoscopic incisional hernia repair: A review of the literature. Hernia 2006;10:110-9. Sajid MS, Bokhari SA, Mallick AS, Cheek E, Baig MK. Laparoscopic versus open repair of incisional/ventral hernia: A meta-analysis. Am J Surg 2009;197:64-72. Pham CT, Perera CL, Watkin DS, Maddern GJ. Laparoscopic ventral hernia repair: A systematic review. Surg Endosc 2009;23:4-15. Eriksen JR, Poornoroozy P, Jørgensen LN, Jacobsen B, Friis-Andersen HU, Rosenberg J, et al. Pain, quality of life and recovery after laparoscopic ventral hernia repair. Hernia 2009;13:13-21. Eriksen JR. Pain and convalescence following laparoscopic ventral hernia repair. Dan Med Bull 2011;58:B4369. Kitamura RK, Choi J, Lynn E, Divino CM. Suture versus tack fixation of mesh in laparoscopic umbilical hernia repair. JSLS 2013;17:560-4. Ahmed MA, Tawfic QA, Schlachta CM, Alkhamesi NA. Pain and surgical outcomes reporting after laparoscopic ventral hernia repair in relation to mesh fixation technique: A systematic review and meta-analysis of randomized clinical trials. J Laparoendosc Adv Surg Tech A 2018;28:1298-315. Bellows CF, Berger DH. Infiltration of suture sites with local anesthesia for management of pain following laparoscopic ventral hernia repairs: A prospective randomized trial. JSLS 2006;10:345-50. Young MJ, Gorlin AW, Modest VE, Quraishi SA. Clinical implications of the transversus abdominis plane block in adults. Anesthesiol Res Pract 2012;2012:731645. Kıtlık A, Erdogan MA, Ozgul U, Aydogan MS, Ucar M, Toprak HI, et al. Ultrasound-guided transversus abdominis plane block for postoperative analgesia in living liver donors: A prospective, randomized, double-blinded clinical trial. J Clin Anesth 2017;37:103-7. Oh TK, Yim J, Kim J, Eom W, Lee SA, Park SC, et al. Effects of preoperative ultrasound-guided transversus abdominis plane block on pain after laparoscopic surgery for colorectal cancer: A double-blind randomized controlled trial. Surg Endosc 2017;31:127-34. Sinha A, Jayaraman L, Punhani D. Efficacy of ultrasound-guided transversus abdominis plane block after laparoscopic bariatric surgery: A double blind, randomized, controlled study. Obes Surg 2013;23:548-53. Suvikapakornkul R, Valaivarangkul P, Noiwan P, Phansukphon T. A randomized controlled trial of preperitoneal bupivacaine instillation for reducing pain following laparoscopic inguinal herniorrhaphy. Surg Innov 2009;16:117-23. Mittal T, Dey A, Siddhartha R, Nali A, Sharma B, Malik V, et al. 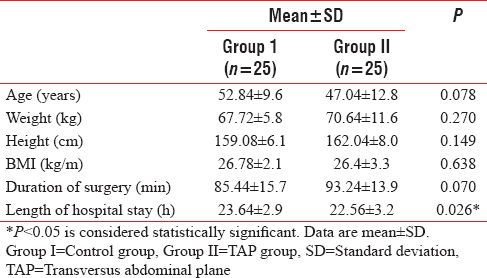 Efficacy of ultrasound-guided transversus abdominis plane (TAP) block for postoperative analgesia in laparoscopic gastric sleeve resection: A randomized single blinded case control study. Surg Endosc 2018;32:4985-9. Charlton S, Cyna AM, Middleton P, Griffiths JD. Perioperative transversus abdominis plane (TAP) blocks for analgesia after abdominal surgery. Cochrane Database Syst Rev 2010;(12):CD007705. Chiono J, Bernard N, Bringuier S, Biboulet P, Choquet O, Morau D, et al. The ultrasound-guided transversus abdominis plane block for anterior iliac crest bone graft postoperative pain relief: A prospective descriptive study. Reg Anesth Pain Med 2010;35:520-4. Abd-Elsayed A, Malyuk D. Efficacy of transversus abdominis plane steroid injection for treating chronic abdominal pain. Pain Pract 2018;18:48-52. McDonnell JG, O'Donnell B, Curley G, Heffernan A, Power C, Laffey JG, et al. The analgesic efficacy of transversus abdominis plane block after abdominal surgery: A prospective randomized controlled trial. Anesth Analg 2007;104:193-7. Griffiths JD, Barron FA, Grant S, Bjorksten AR, Hebbard P, Royse CF, et al. Plasma ropivacaine concentrations after ultrasound-guided transversus abdominis plane block. Br J Anaesth 2010;105:853-6. Kato N, Fujiwara Y, Harato M, Kurokawa S, Shibata Y, Harada J, et al. Serum concentration of lidocaine after transversus abdominis plane block. J Anesth 2009;23:298-300. Abdallah FW, Chan VW, Brull R. Transversus abdominis plane block: A systematic review. Reg Anesth Pain Med 2012;37:193-209. De Oliveira GS Jr., Castro-Alves LJ, Nader A, Kendall MC, McCarthy RJ. Transversus abdominis plane block to ameliorate postoperative pain outcomes after laparoscopic surgery: A meta-analysis of randomized controlled trials. Anesth Analg 2014;118:454-63. Fields AC, Gonzalez DO, Chin EH, Nguyen SQ, Zhang LP, Divino CM, et al. Laparoscopic-assisted transversus abdominis plane block for postoperative pain control in laparoscopic ventral hernia repair: A Randomized controlled trial. J Am Coll Surg 2015;221:462-9. Baeriswyl M, Kirkham KR, Kern C, Albrecht E. The analgesic efficacy of ultrasound-guided transversus abdominis plane block in adult patients: A Meta-analysis. Anesth Analg 2015;121:1640-54. Hosgood SA, Thiyagarajan UM, Nicholson HF, Jeyapalan I, Nicholson ML. Randomized clinical trial of transversus abdominis plane block versus placebo control in live-donor nephrectomy. Transplantation 2012;94:520-5. Carney J, McDonnell JG, Ochana A, Bhinder R, Laffey JG. The transversus abdominis plane block provides effective postoperative analgesia in patients undergoing total abdominal hysterectomy. Anesth Analg 2008;107:2056-60. Walter CJ, Maxwell-Armstrong C, Pinkney TD, Conaghan PJ, Bedforth N, Gornall CB, et al. A randomised controlled trial of the efficacy of ultrasound-guided transversus abdominis plane (TAP) block in laparoscopic colorectal surgery. Surg Endosc 2013;27:2366-72. Carney J, Finnerty O, Rauf J, Curley G, McDonnell JG, Laffey JG, et al. 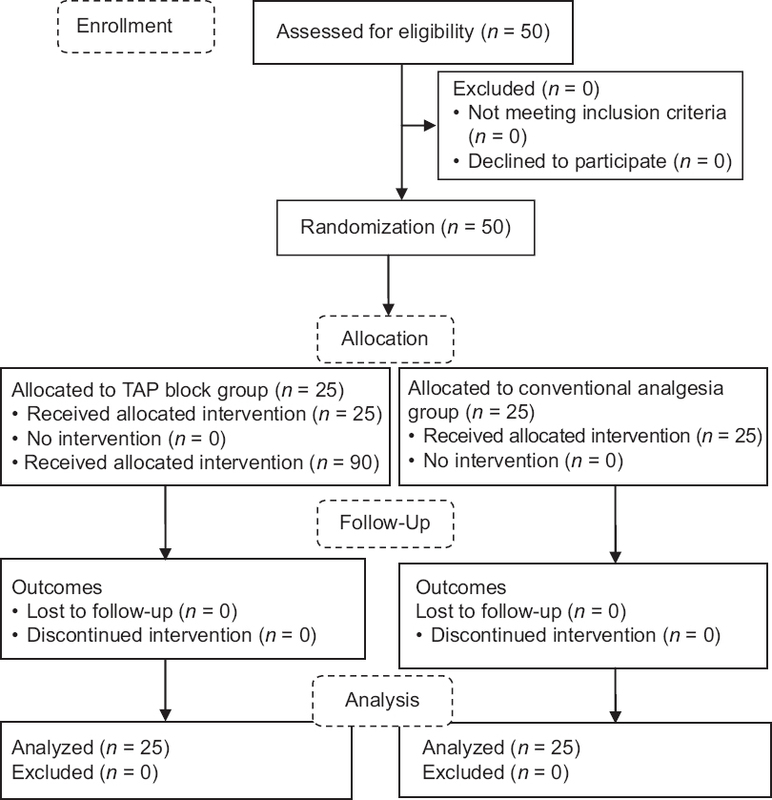 Ipsilateral transversus abdominis plane block provides effective analgesia after appendectomy in children: A randomized controlled trial. Anesth Analg 2010;111:998-1003. Johns N, O'Neill S, Ventham NT, Barron F, Brady RR, Daniel T, et al. Clinical effectiveness of transversus abdominis plane (TAP) block in abdominal surgery: A systematic review and meta-analysis. Colorectal Dis 2012;14:e635-42. Essving P, Axelsson K, Kjellberg J, Wallgren O, Gupta A, Lundin A, et al. Reduced hospital stay, morphine consumption, and pain intensity with local infiltration analgesia after unicompartmental knee arthroplasty. Acta Orthop 2009;80:213-9. Said AM, Balamoun HA. Continuous transversus abdominis plane blocks via laparoscopically placed catheters for bariatric surgery. Obes Surg 2017;27:2575-82. Hain E, Maggiori L, Prost À la Denise J, Panis Y. Transversus abdominis plane (TAP) block in laparoscopic colorectal surgery improves postoperative pain management: A meta-analysis. Colorectal Dis 2018;20:279-87. Roth JS, Park AE, Witzke D, Mastrangelo MJ. Laparoscopic incisional/ventral herniorrhaphy: A five year experience. Hernia 1999;3:209-14. Ramshaw B. Laparoscopic ventral hernia repair. In: Fischer JE, Bland KI, editors. Mastery of Surgery. 5th ed., Vol. 2. Philadelphia: Lippincott Williams and Wilkins; 2007. p. 1964. Chowbey PK, Sharma A, Khullar R, Mann V, Baijal M, Vashistha A. Laparoscopic ventral hernia repair. J Laparoendosc Adv Surg Tech 2000;10:79-84. Keller DS, Ermlich BO, Delaney CP. Demonstrating the benefits of transversus abdominis plane blocks on patient outcomes in laparoscopic colorectal surgery: Review of 200 consecutive cases. J Am Coll Surg 2014;219:1143-8. Scharine JD. Bilateral transversus abdominis plane nerve blocks for analgesia following cesarean delivery: Report of 2 cases. AANA J 2009;77:98-102.